The Adams Watson Wedge Pack includes three tour-preferred wedges with a non-glare finish, enhanced feel and a molded TPU vibration dampening medallion. 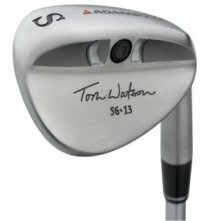 Tom Watson and Adams Golf have a proven combination of performance and style. From shaping to sole grinds, every aspect of the Adams Watson Wedges meet the demanding standards of eight time major winner and one of golf's greatest wedge players. Great Touch Around The Greens! From Anonymous of Salt Lake City, Utah on 8/24/2007 . This club makes up and downs a reality! 8/24/2007 – Does this come in 60 Degree?